My wife has been quite sick lately, and feeling a bit down. My wife also likes cream cakes, of the sort that come filled with milk soaked sugar particles and have chocolate icing on the top. So while shopping in one of Johannesburg’s better (yet surprisingly inexpensive) supermarkets for food quality (Food Lover’s Market, if you must know) I picked up these. 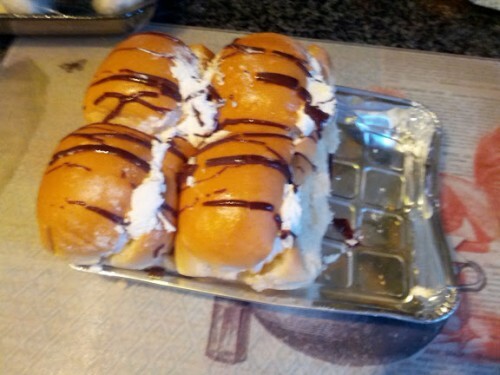 The enticingly labelled ‘cream buns’ appeared to be just the thing to cheer said wife up. Imagine, then, our surprise upon opening the cream buns to discover that they are exactly that. Bread buns – rolls, cobs, call them what you will – cunningly disguised to look like cakes. No wonder the guy selling them had a wicked smile on his face – I thought he was laughing about some sinful diet transgression that might be contained beneath the shrink wrap. Ever had a cream and chocolate sandwich on fresh white bread? No, you haven’t, because it’s disgusting. Cream cakes = good if you like that sort of thing (I’m not a massive fan myself). Cream sandwiches… not so much. It’s a bit like someone in the bakery saw one next door and thought ‘I can do that’. Wonder if this exciting addition to the product line will be there next week.